GSK3a from other species may also be detectable. 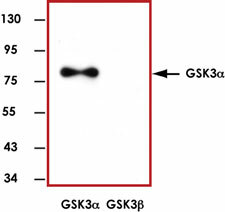 Sample Data :Representative western blot (1:1000) with Anti-GSK3α using 20 ng of GST-tagged human recombinant GSK3α and GSK3β. Scientific Background :GSK3α is a multifunctional protein serine kinase, homologous to Drosophila 'shaggy' (zeste-white3) and implicated in the control of several regulatory proteins including glycogen synthase and transcription factors (e.g., JUN) (1). GSK3α also plays a role in the WNT and PI3K signaling pathways. Alzheimer disease is associated with increased production and aggregation of amyloid-beta-40 and -42 peptides into plaques. GSK3α is required for maximal production of the beta-amyloid-40 and -42 peptides generated from the amyloid precursor protein by presenilin-dependent gamma-secretase cleavage. In vitro, lithium, a GSK3α inhibitor, blocks the production of the beta-amyloid peptides by interfering with the gamma-secretase step (2). 1. Ali, A. et al: Glycogen synthase kinase-3 : properties, functions, and regulation. Chem. Rev. 101: 2527-2540, 2001. 2. Phiel, C J. et al: GSK-3-alpha regulates production of Alzheimer's disease amyloid-beta peptides. Nature 423: 435-439, 2003.